If you have been charged with Driving Under the Influence (DUI) in Scottsdale, Arizona it is important that you get experienced legal representation. This is because the City of Scottsdale and the State of Arizona have some of the most strict and punishing laws regarding DUI in the nation. Your best chance to minimize the punishment is to hire an experienced Scottsdale DUI Lawyer from the DMCantor. Over the last 25 years, David and his team have over 2,900 documented DUI Case Wins in Arizona. You need a DUI defense team that takes pride in knowing more of the top DUI defense strategies for Arizona DUI defense than the prosecution and police officers. DMCantor will be “Beyond Aggressive” in your defense. A conviction for DUI isn’t something you want on your record. The implications of a conviction are far reaching and the consequences can haunt you for a number of years. A DUI conviction can prevent you from getting a good job, getting your dream house, and can cost you a lot of money now and in the future. Our Drunk Driving Lawyers have years of experience in the Scottsdale City Court system and are very familiar with the judges and how their courts work. This is definitely a step ahead of other law firms. If you hire us to defend you, we won’t leave any stone unturned. We’ll conduct independent tests with our experts, and will work exhaustively to find any DUI Defense that will apply to your case so we can achieve a successful result for you. In 2014, David was recognized as one of the 10 best DUI Lawyers in terms of client satisfaction by the American Institute of DUI/DWI Attorneys. David Michael Cantor is also a member of the National College for DUI Defense and is a Certified Criminal Law Specialist by the Arizona Board of Legal Specialization. Get a Free DUI Consultation – Call us at 602-307-0808 to schedule. 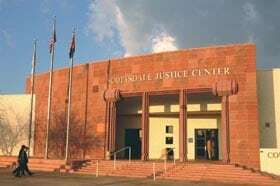 Click here to learn more about Scottsdale City Court. If you’re ready to speak with a drunk driving defense attorney about your case, give us a call at (602) 307-0808 to schedule a free case review. Our office are available 24 hours a day via phone or by using our secure email form. By calling our office you can be in touch with a DUI lawyer 24 hours a day, we’re here to help.